Read how Ozone Resolved Hydrogen Sulfide and Color Issues in Well Water at the Four Way Special Utility District Water Plant Number 3 in Eastern Angelina County, Texas. Computational fluid dynamics (CFD) modeling is a valuable tool in the design of sidestream Venturi injection piping systems in municipal ozone treatment. Mazzei’s Jim Jackson & Sri Pathapati explain how CFD has been used to resolve performance issues in the November/December 2013 issue of “WorldWater” — TAKE A LOOK. Water quality issues plague most municipal water agencies. The issues range from disinfection to purification to aesthetics. Ozone (O3) is a naturally occurring compound in the form of a gas that is a powerful oxidizer and strong disinfectant. For more than 30 years the bottled water industry has been using ozone to effectively treat its water. The treatment ensures a quality product that customers pay a premium for. Treating drinking water with ozone creates a product that tastes good and is aesthetically pleasing — it is safe, good-tasting water with fewer chemicals. 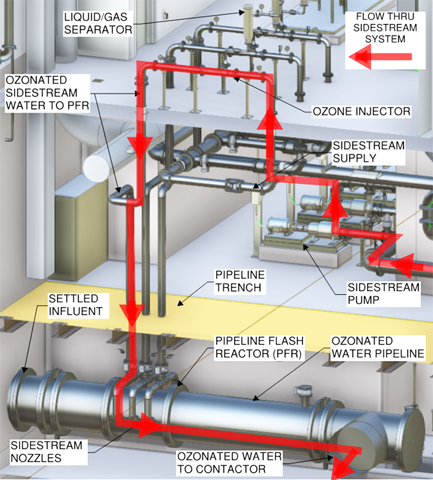 Let Mazzei help you design an ozonation system that meets all your needs — CONTACT A MAZZEI SALES ENGINEER to get the process started.